Is your furnace starting to make funny noises? This is just one of many signs that it could be time for a furnace replacement. Don’t wait until it is too late! Contact us today to schedule a service or replacement for your furnace. If you are making constant heating repairs, a new furnace can help you save money in the long run. A high-efficiency furnace could be just what you need to lower monthly energy bills and avoid expensive HVAC repairs. Our experienced technicians are waiting to help you with your new furnace, call us today to learn more. Keep reading to learn when you should call an HVAC technician to install a new home heating system. Given proper maintenance, furnaces can last up to 15 to 20 years. If your house furnace was installed before you moved in, try to find the serial number. Companies often hide the date of manufacture within the serial number. Since it can be hard to determine the furnace age from just a serial number, we recommend asking an HVAC technician to find it during your next furnace service visit. If your furnace is approaching the end of its natural life, you’ll want to start budgeting for replacement. Furnaces can become less energy efficient from the natural wear and tear of internal components. Your furnace may have lost energy efficiency if you notice forced air heating turning on more frequently to maintain the temperature on your thermostat. When your furnace has to work harder to produce the same amount of heat, it uses more energy. As a result, you may see an increase in your energy bills during cold weather. High energy bills can be a sign it’s time to replace your heating furnace. While swapping out an air filter is affordable enough, the same can’t be said of constant HVAC repairs. If your forced air furnace needs frequent repairs, you may want to consider replacement. Paying for a new furnace is often less expensive than paying for constant repairs in the long run. 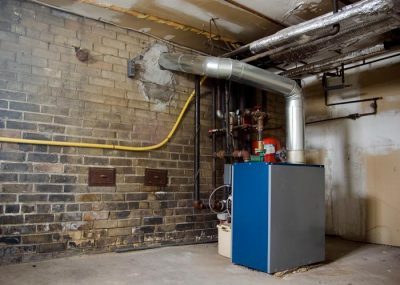 When your heating system starts making noises you’ve never heard before, it may be time to replace your furnace. With advances in technology, HVAC companies now offer high-efficiency gas furnaces and other models that run quietly while saving you money in the long run. If you hear a strange sound from your furnace, it’s important you call your HVAC technician as soon as possible. Sometimes a small repair is all it takes to get your furnace running normally again. Your oil or gas furnace should maintain enough indoor humidity to minimize the amount of dust particles in your home. However, indoor air can feel drier and dustier once your furnace loses energy efficiency. While you may just need to replace the air filter, a persistent problem could indicate that it’s time to replace the entire heating system. Our HVAC technicians are dedicated to helping you keep your home a comfortable temperature year-round. We offer a range of heating and cooling services and are proud to serve customers just like you. To schedule an estimate for furnace installation or replacement, call (616) 225-9150.